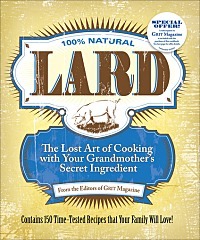 The title of this book puts it right out there, lard is back. For centuries it was actually the fat of the pig that was the prize rather than the meat. A shift in our collective mindset, however, put animal fats on the outs as vegetable-based fats became the new health salvation. We’re a fickle society when it comes to diet and nutrition. The advent of Crisco, TV commercials touting less greasy chicken when fried in Wesson and the promise of feeling like royalty with one bite of Imperial margarine made casting aside animal fats for these newer and “healthier” options an easy sell. Now of course the joke is on us as we’ve come to learn many of these vegetable-based fats contain trans-fats, which are actually worse for us than saturated animal fats. A chorus of praise for cooking with lard has been growing over the last few years and the Editors of Grit Magazine are singing at the top of their lungs. The title of their new book aptly points out the full-circle irony of our society’s fickle culinary ways. I for one am happy to land right back in grandma’s kitchen and reach for the lard. In 2006 I began rendering my own lard after reading an article about the spectacular baked goods, namely pie crusts, that could be achieved with lard. My use of lard has been limited to pie crust all these years, so I was thrilled to receive a review copy of Lard, The Lost Art of Cooking with Your Grandmother’s Secret Ingredient from Andrews-McMeel publishing to see what else the Editors of Grit Magazine are making with this magnificent ingredient. The book opens with a chapter on breads and biscuits, so I started with the obvious, biscuits. 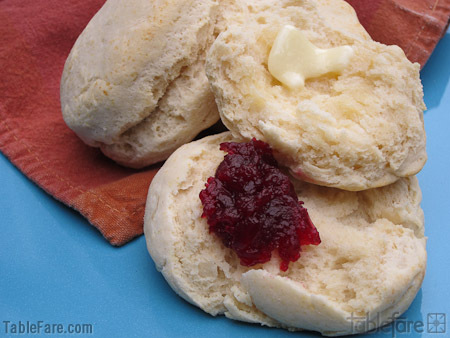 Cook’s Illustrated’s Fluffy Biscuit recipe has been my go-to for years and with one bite of these all-lard biscuits I was instantly rethinking my biscuit-making ways. It all comes down to texture; lard lends a spectacularly tender, crispy, crumbly, flaky texture that simply can’t be replicated by other fats. While indulging in a second biscuit my previously long-held association of lard being an artery clogging, heart disease inducing, fatty-fat-fat that I shouldn’t be eating surfaced out of nowhere. Strangely I wasn’t the least bit phased by the butter I was slathering on my delicious biscuits, which has more saturated fat than lard (a fact I’ve seen reported by a variety of sources, giving me confidence in the claim). I was simply experiencing an irrational fear-based association left over from the “vegetable fat is our salvation” era. Granted, lard is still a fat and like any fat, eating too much of it isn’t advisable. 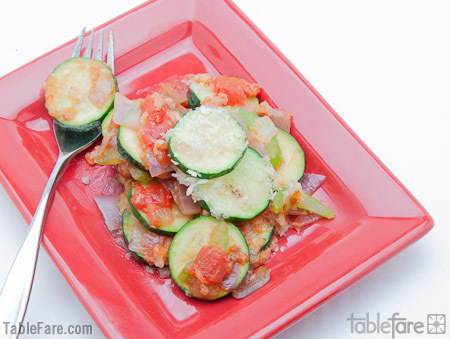 A simple sauté of Italian squash, onions, garlic, celery and tomato sauce. After working my way through the chapters on vegetables, entrees, brownies and cookies, desserts, cakes, and of course pies, it’s clear that lard has a place in every category of food. The recipe collection was culled from Grit and Caper’s magazine reader’s contributions over the past 130 years. The magazine’s editors carefully selected and tested the recipes weaving them together with helpful, history-studded headnotes as well as reader’s personal stories and anecdotes about lard. The recipes are all very approachable, down-home cookin’ type dishes. The recipe for Italian Squash is a great example (and reminder) of how well lard works for simple sautés. 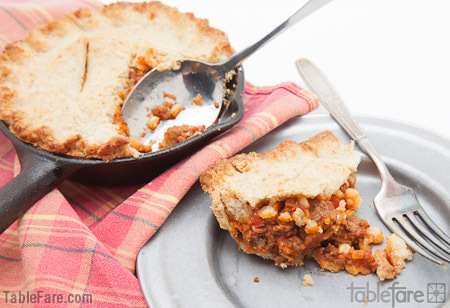 The most exciting result of the recipes I tested was the Fiesta Beef Potpie. Like all the recipes in the book it’s a very straightforward dish to put together. The beef filling is a sauté of onion, green pepper, and cubes of beef chuck, or ground beef in my case. A can of tomatoes, corn, green chiles and black olives are stirred in along with chili powder, cumin, and red pepper for a spicy kick. It’s the crust that really blew me away. Flour, cornmeal, and toasted wheat germ are combined with lard to create a fantastic flavor and crumbly, crunchy texture. It’s pushed over the top with the addition of grated cheddar cheese, and a simple egg wash adds a beautiful golden finish once baked. I made individual portions in ramekins and froze extras unbaked, which made for a few no-effort dinners in later weeks. A few particularly interesting recipes that caught my attention were Carrot Fries, Yam Drop cookies, and Bizcochitos, which happen to be the state cookie of New Mexico. This of course sent me right to Google to look up my state’s cookie. Sadly there isn’t one for Washington. 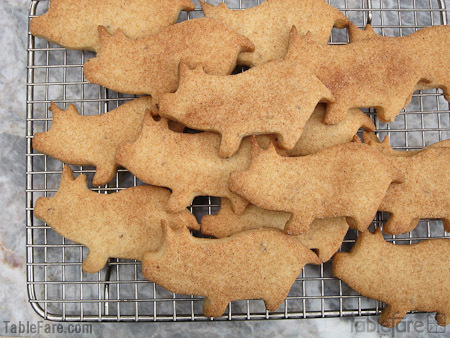 The bizcochito dough is studded with anise seeds, spiked with a bit of brandy, dusted with cinnamon and sugar, and the pig-shaped cutouts were my little ode to lard. Given my spice obsession I loved the use of whole anise seeds, but will punch up the anise flavor even more next time by adding an additional ½ teaspoon of ground anise seed. The texture of these cookies is remarkable and proves the point for using lard in baked goods. When I first tasted this cookie I expected to taste butter and was a bit thrown by it’s absence, but then realized it’s the remarkable texture and flavor from the spices that make these cookies special, and I should warn, addictive. Despite using lard in combination with butter in my pie crusts for many years, this was my first time making an all-lard crust. Just like the biscuits and Bizcochitos the all-lard crust was great and made all the better by the Apple-Maple-Raisin filling. This might be the best apple pie filling I’ve ever had. Sweetened with maple syrup, enriched with heavy whipping cream, spiced with cinnamon and my favorite spice of all time, cardamom, I was very reluctant to share slices of this pie with anyone. As much as I love diving into a challenging, avant-garde, chefy recipe, I also love simple home cooking and that’s what this book is all about. It’s quite likely these recipes are dishes you’ll recognize from your grandma’s kitchen. Lard, The Lost Art of Cooking with Your Grandmother’s Secret Ingredient will have you embracing this long-loved, briefly demonized, and again loved ingredient in no time. I have this book to thank for expanding my lard world to so much more than just pie crusts. As a special bonus, the Editors of Grit Magazine have included a coupon for a free one-year subscription to their magazine with every book. You can learn to cook with lard and bone up on your rural American know-how, such a deal! 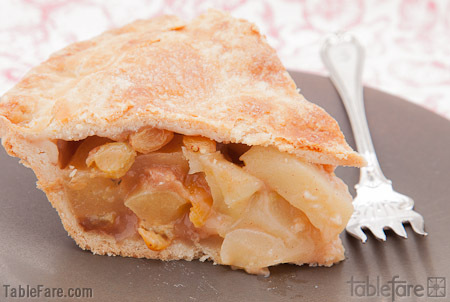 Tags: Andrews McMeel Publishing, Apple pie, Beef potpie, Book review, Grit Magazine, lard This entry was posted on Friday, May 4th, 2012 at 2:48 pm	and is filed under Books. You can follow any responses to this entry through the RSS 2.0 feed. You can leave a response, or trackback from your own site. Wow! What an amazing review and photos. Thank you for taking the time to cook through this book and let everyone know what you found. Hopefully the tides are beginning to change about fats in this country as the real story begins to unfold. Bravo! 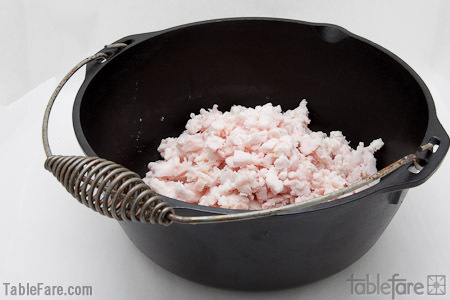 Since I’m allergic to soy, and Crisco is soybean oil and cottonseed oil, I’ve been using Lard for a long time. I love it, especially for baking. Great blog! I didn’t know I could my apple pie with lard. Very interesting.